Lovely cooked & buttered white asparagus! Yummy! This is one of the main asparagus dinners I make when white asparagus are in season. 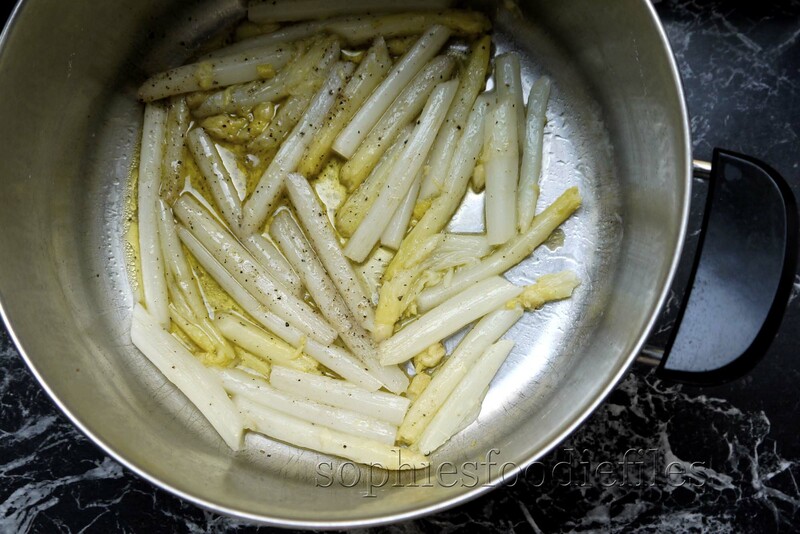 White peeled asparagus are cooked, drained, browned & heated through in vegan butter. Then, scattered chives are thrown all over the dish. This is a delectable & festive meal, mostly made in the oven. I buy my potato wedges, precooked, in my supermarket. Easy does it here! Enjoy this tasty dinner with a lovely white Sauvignon wine. 2 bunches of 500 gr white Belgian asparagus, not too thick, the outside tougher peel removed, the toughest & wooden thick end part, cut off, cut into 2/ You can’t eat the white outer peel of the white asparagus! an organic dried Mediterranean herb mix sea salt, I used the brand Lebensbaum/ Bought it in the Bio-planet! 1. Preheat your oven to 180°C ( 350 F ) for 10 minutes. Prepare your salmon. Take a fitting oven dish & smear it in with planta. This is a vegan baking butter. Prepare your salmon fillets. Clean them, pad dry on kitchen paper & season with finely grinned black pepper & some sea salt flakes. Season well. Place the 2 fish fillets besides each other in the dish. Then, prepare your oven baked potato wedges. Place them in 1 layer in a non-stick oven dish & pour 2 to 4 tablespoons of a fruity evoo all over them. Add some grins of finely black pepper & some fine grins of the mixed dried herbs sea salt. With clean hands, mingle everything together. Place the 2 oven dishes in the oven & bake until the fish is cooked through & the potato wedges are golden brown & cooked through. I bake my fish about 20 to 35 minutes. You don’t want to overcook the fish!!! Check with a thin pin to see if the fish is ready. The potatoes take about 25 to 35 minutes to cook too. I turn my wedges around, after half of the cooking time is gone, to brown evenly. 2. In the meantime, when the oven dishes are nearly ready & only take about 15 minutes to cook, cook your asparagus. Cook your peeled & cut asparagus in salted boiling water until al dente. This will take a few to 6 minutes depending on the size of your asparagus. Drain well but avoid breaking the cooked asparagus! When ready, take the same hot pot but empty all the water. Heat up on medium high. When hot, add some planta & heat up. When hot & sizzling, add the cooked asparagus & fry until golden & surrounded by the vegan butter. Add some seasoning. I used black pepper but if you prefer you can use white pepper. It is your choice but I don’t like the taste of white pepper. When heated through & hot, scatter some chive pieces all over the asparagus. 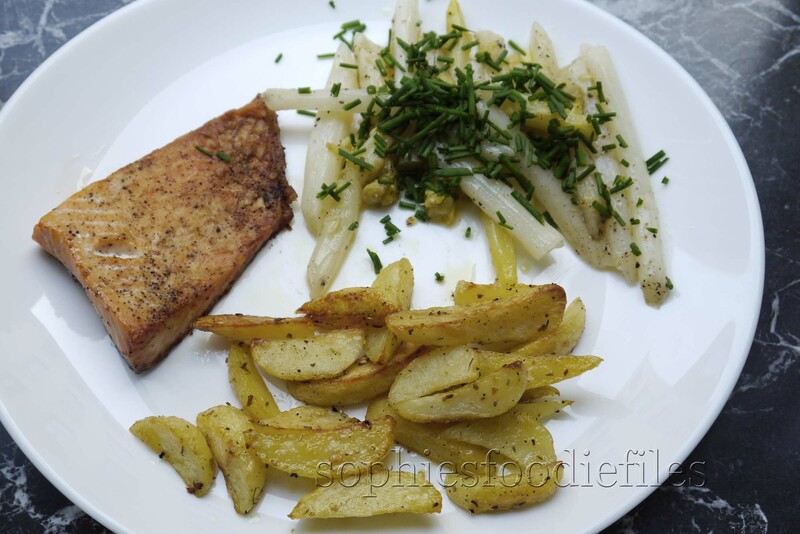 Place a fitting lid on & serve instantly with the salmon & the baked potato wedges. Happy eating & don’t forget the lovely wine! 🙂 Stay tuned, Subscribe by email through the link below to get my new cool newsletters aka posts! Join 1,850 email Subscribers! It is free! Next Post Sophie’s vegan cheddary cheese spread! Ooh yeah! That looks so good Sophie. I love asparagus, although I have to confess that I’m a bigger fan of the green ones then of the white ones but I still think they’re pretty marvelous! How lovely! I only rarely see white asparagus in the store. What a special treat to serve with salmon! What a lovely dish, Sohie, glad that you feel better! Thanks, Linda & enjoy the asparagus & baked potatoes! Mmm… absolutely love white asparagus! This is a lovely meal! What a coincidence! I was literally at the grocery store today when I saw white asparagus for the first time this year. I didn’t pick any up because I thought to myself “hmmmm what would I make! ?” but I should have bought some. I’ll have to next time and try your lovely recipe, Sophie! We are beginning to see white asparagus in the grocer store but not very often. Fabulously balanced meal with a glass of wine, cannot get any better. Ah, yes, my parents told me it was white asparagus season in Belgium and France. I used to only eat the green kind, but I’ve learned to appreciate the white ones as well. This is a great, balanced meal! Yum, what a tasty looking meal! White asparagus is hard to find in Australia, but I ate a lot of it when I lived in Holland and really came to appreciate it. Do, my friend! 🙂 Do! I’ve haven’t had white asparagus in such a long time, must look for some! I didn’t know you could bake salmon! How curious! No, Miranda? Try & you will see that the salmon is perfectly roasted! Now there is your white asparagus! Would love this meal. The asparagus looks delightful! White asparagus is uncommon here in the US, but I really enjoyed it in Germany a couple years ago.